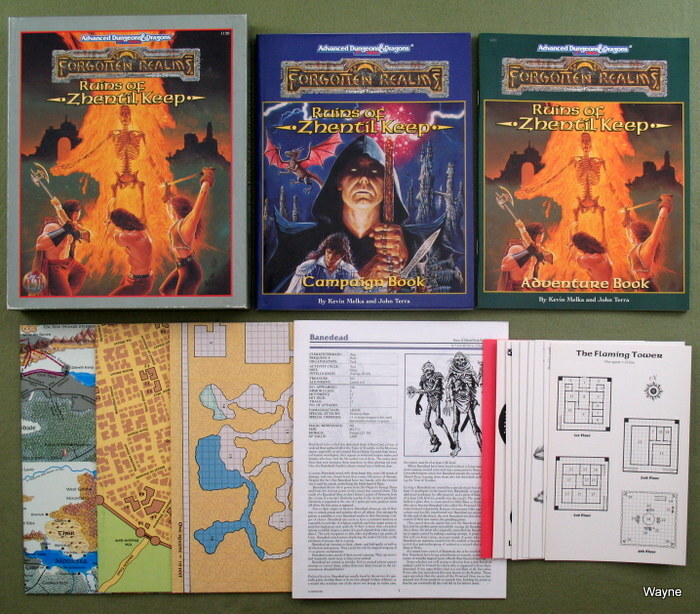 The classic "Gray Box" for 1st edition AD&D. The first two are scaled 1 inch = 30 miles. 1031XXX0701 Sword Coast: Daggerford, south to Beregost, east to Anauroch. 1031XXX0702 Thar in the north, south to the Sea of Fallen Stars, Anauroch in the west, east to Impiltur. The second pair are scaled 1 inch = 90 miles. They encompass the entire traditional Forgotten Realms at large scale. Later print runs, dated 11/91 & 8/92 (2/89, 1/90 & 3/91 were transitional sets, old logo, new maps), can be distinguished by the switch to the TSR "gold badge" style logo and a modernized barcode on the back. The maps' colors were altered; from the original turquoise ocean color to a more deep blue, and land shifting to a more orange-ish tone. It appears that the second two maps were dropped from some of these sets [and the mylar overlays(?)]. Still need to verify this. 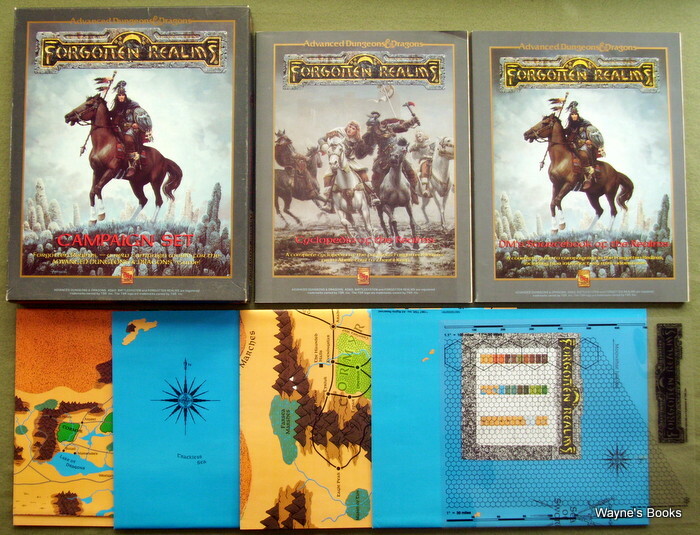 "Within this box is everything needed to visit the fabulous Forgotten Realms. The 96-page player's book contains entries on all known areas, cities, people, and things, presented in alphabetical order. Numerous maps outline the more well-known cities and lands. 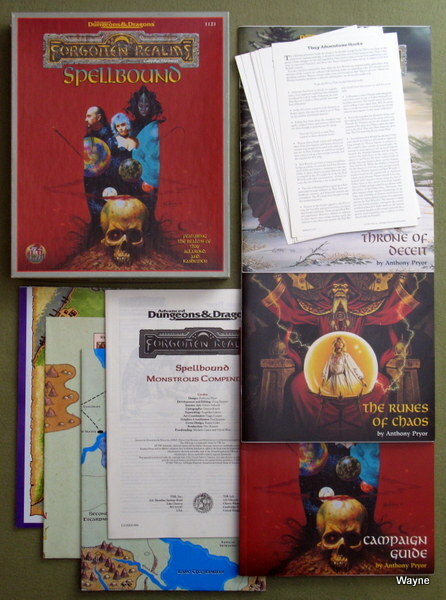 The 96-page DM's book contains all the information pertinent to running a campaign set in this fantasy world, from how to bring existing characters into the Forgotten Realms to two complete introductory mini-adventures to a listing of known magical texts and the magics contained therein. 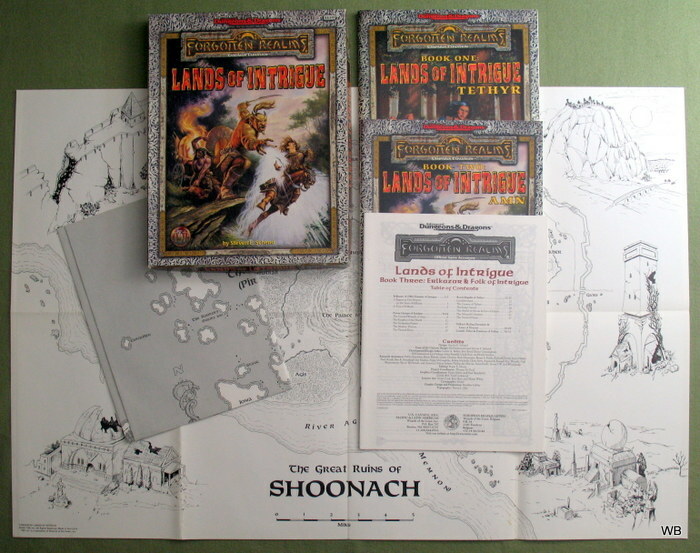 Four full-color maps show the entire lands and details of the more well-known areas. Adventuring rules specific to the Forgotten Realms have been included." 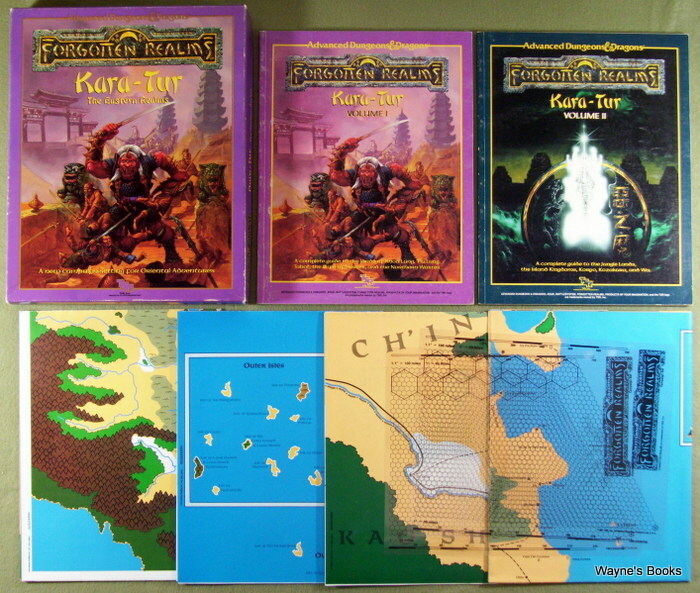 Two 96-page books describe the places, culture, politics, monsters, magic, people, relgions, and more, plus advice on running a long-term Oriental Adventures campaign, bringing characters from other worlds into Kara-Tur, and dimensional travel from Kara-Tur to other worlds. And there are four full-color, two-sided maps of this land of mighty warriors and powerful enchantments." 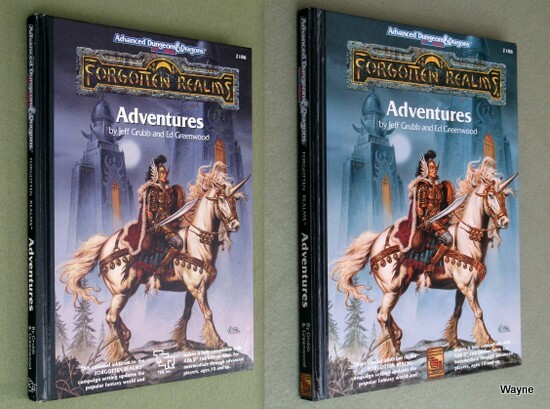 This hardback served to update the Forgotten Realms campaign to AD&D 2nd edition rules. "The coming of the Avatars and the Time of Troubles caused tremendous changes in the Forgotten Realms. Areas of dead magic and wild magic have appeared; character classes have been altered; new magical spells have been discovered; old gods have been slain and new ones arisen. All the changes and updates are incorporated into this one essential volume for FORGOTTEN REALMS players and dungeon masters alike. Get new information on specialty priests, currency, new weapons, and treasure. Take a detailed tour of the major cities of the heartland, from the Sword Coast to the Dragon Reach, including the Moonsea, the Dalelands, Cormyr, and Sembia. The most popular and intriguing fantasy world ever published gets even better with this fantastic supplement." "It is a world where the gods have walked and fantastic armies clashed. It is the home of Elminster, Alias, Azoun, Khelben, and Drizzt the dark elf. It is the most popular fantasy campaign in history. Well met, traveler, and welcome to the Forgotten Realms! 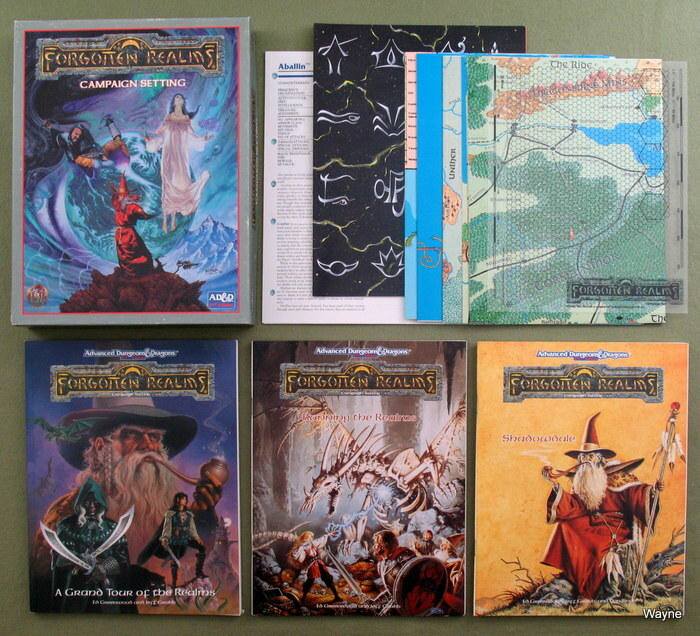 Designed for the AD&D game, the new FORGOTTEN REALMS Campaign Setting is a major expansion and complete revision of the original, best-selling boxed set. This set contains everything that a player or Dungeon Master needs to launch into a world of adventure and imagination. * A Grand Tour of the Realms - a 128-page book, concentrating on the Heartlands, the land of the Dales, Cormyr, and Waterdeep, and chock full of useful information about other significant Realms locations on the continent of Faerun. * Running the Realms - a 64-page guide to the Forgotten Realms for the Dungeon Master, showing how to create a Realms campaign, and giving details about secrets, NPCs, and deities of the Realms. * 6 card sheets showing nearly 100 signs, trail glyphs, symbols, magical sigils, and religious symbols of the Realms in full color. * 4 all-new four-color maps, two of eastern and western Faerun, and two smaller-scale, detailed maps of the heartlands of the Realms." "Ruled by the feared and respected Houses and their Matron Mothers, Menzoberranzan is a place of great nobility and great treachery. The priestesses of Lloth, the Spider Queen, demand (and receive) complete respect from the citizens of this mighty city. But what of the common folk - the drow of non-noble birth, the humans, and others? What is their lot in life, in this magnificent den of intrigue? 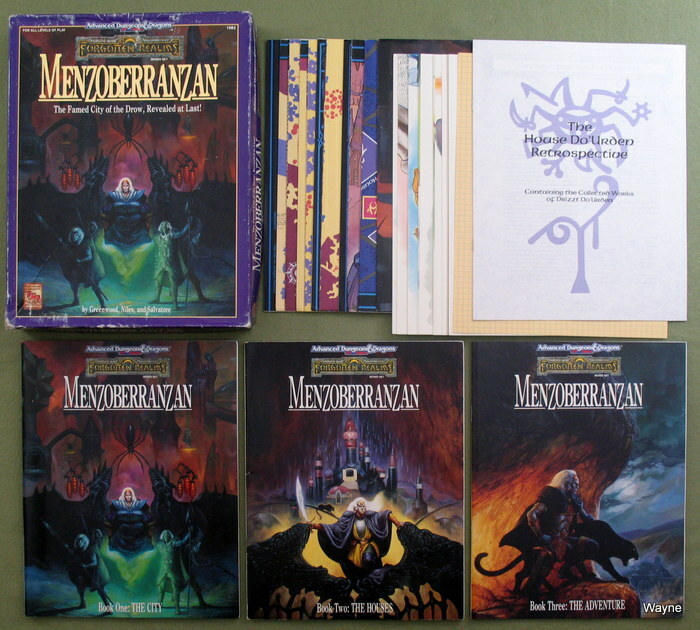 Three books in this boxed set explain the ways of Menzoberranzan in detail. Book One: The City gives the reader a tour of the streets and districts, a wealth of information on various practices and customs, and an overview of daily life for each class of citizen (and non-citizen). Book Two: The Houses presents all eighteen major and minor Houses of the city, including the Matron Mothers and their immediate families, as well as any important advisers and associates. Book Three: The Adventure gives players a chance to take their characters into the web of deceit and intrigue woven by the denizens of this famed city. 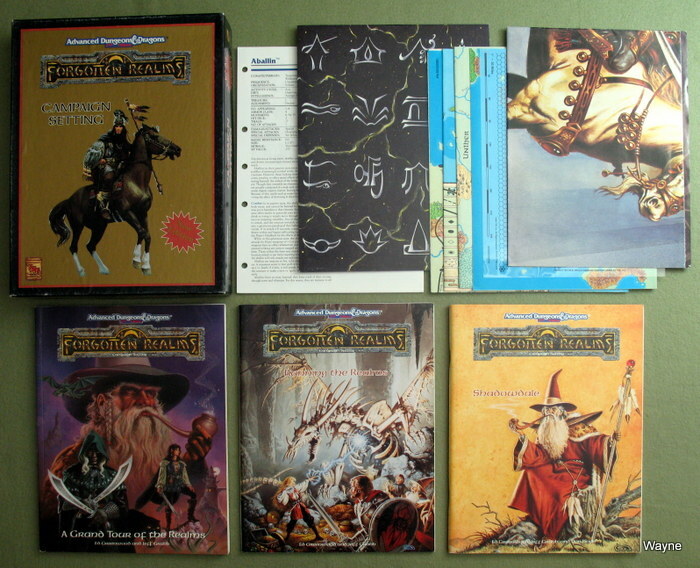 Additionally, this boxed set includes: • four connecting poster-sized maps of the city proper; • one poster map of the House Baenre compound; • a poster showing the rivalries and alliances among all eighteen major and minor houses; • a 16-page House Do'Urden retrospective and the collected essays of Drizzt; • twelve cardsheets containing in-depth statistics on main characters from Houses Nurbonnis and Millithor, and small maps for use in the adventure; • and a full-color poster of the stunning box cover art by Jeff Easley." I've noticed that the Jeff Easley poster is very often missing from used sets. * Carcelen Millithor (Second Daughter of House Millithor). "Known throughout the Realms as the headquarters of the Zhentarim, Zhentil Keep has long been a trade hub, a seat of power, and a nest of corruption at the edge of the Moonsea. This boxed set details Zhentil Keep in the days of the Bane of the Black Lord, before the Time of Troubles. It also presents the new Zhentil Keep, a city nearly destroyed by the insane Cyric, Prince of Lies. * A 128-page sourcebook detailing the old and new Zhentil Keep, the history of the city, the sinister Black Network, and important villains. * A 64-page adventure book with three new perilous adventures that take heroes into Zhentil Keep, under it, and to nearby communities. * Three poster maps depicting the old Zhentil Keep, the new Zhentil Keep, and the activities of the malevolent Zhentarim. * Eight cards describing areas containing some of the most nefarious NPCs and monsters ever to be associated with Zhentil Keep." "The Unapproachable East. Legendary region of unrivaled magic and profound mystery, the lands on the border of the Endless Waste have tantalized and captivated adventurers in the Forgotten Realms since word of their existence reached the west. Few have returned from travels in those lands, and those who did reveal tales too peculiar for truth - or so it was though until now. Here at last are the secrets of three of the most mysterious - and dangerous - nations in all of Faerûn: Thay, land of the treacherous Red Wizards; Aglarond, home to the unimaginably powerful Simbul; and Rashemen, realm of enigmatic Witches and wild berserkers. Adventurers beware: The treasures and excitement of the Unapproachable East invite the courageous, yet strangers are never welcomed! • A 128-page Campaign Guide to the three countries, including city maps and unique sites, new character kits, spells, magical items, and major NPCs. • Two 32-page adventures that immerse the PCs in the often-deadly power politics of the region. In Throne of Deceit the characters must defend Rashemen from a deadly invasion by Thayan wiardry. The Runes of Chaos sends adventurers into the heart of Thay itself to foil the mad schemes of the would-be Thayan conqueror Szass Tam. • A 16-page MONSTROUS COMPENDIUM booklet featuring twisted Thayan creations, the unpredictable nature spirits of Rashemen, and fearie creatures from the depths of Aglarond's magical Yuirwood. 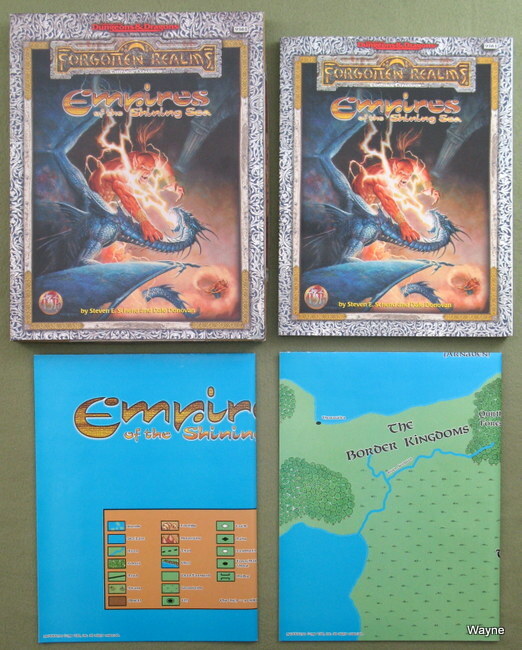 • Eight full-sized card sheets providing adventure hooks and encounter charts for the three realms, useful DM information, and player aids for the adventures. • Three full-color maps - two of the region, displaying greater detail than ever seen before, and one of Eltabbar, the capital city of Thay." "The Savage Frontier, the Barbaric North, the Cold Wastes, the Uneducated Backyard. These, among many others, are nicknames for the North. This is a land of rabid monsters and ruthless barbarians, where nature is the strongest force foe leagues in any direction. 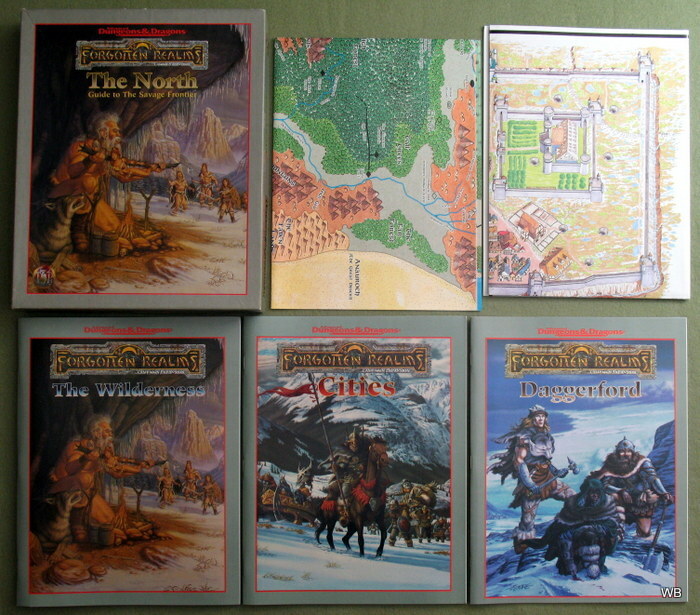 The North campaign expansion for the FORGOTTEN REALMS setting is the authority on the lands from Daggerford in the south to Ten-Towns in the north, from Anauroch in the east to the Ice Peak in the west. • The Wilderness - A 96-page timeline and geographical overview of the north, featuring a description of the land's natives and monsters and including out-of-print information found in TSR's accessory FR5 The Savage Frontier. • Cities and Civilization - 64 pages of facts on all the cities, towns, and hamlets in the North. • Daggerford - a 32-page book describing a complete city designed to be a hometown for your campaign's bravest heroes, with detailed building descriptions based on information from the old TSR adventure N5 Under Illefarn. • Two Poster Maps - Full-color sheets showing the entire environs of the North. On the reverse side is a map of the town of Daggerford, plus an extensive set of random encounter tables." * Book One: Tethyr (96 pages) presents the many facets of Tethyr, from its origin as an elven homeland through its rise and fall as a human nation and up to its recent restoration from anarchy. While this growing realm is now the safest of the Lands of Intrigue, it was once a seat of the malevolent Empire of Shoon - whose influence still haunts the golden plains in the form of roving monsters, wandering ghosts, and the terrors of times past. * Book Three: Erlkazar & Folk of Intrigue (32 pages) reveals the formerly undocumented domain of Erlkazar, east of Tethyr - an area ready to be fleshed out by DMs to suit their individual campaigns. Book Three also holds the secrets of the hidden powers of the South, such as the Cowled Wizards, the Knights of the Shield, the Shadow Thieves, and the undead sorcerors of the Twisted Rune. * Two poster maps detail the Lands of Intrigue, the Pirate Isles of the Nelanther, and the center of the long-dead Shoon Empire, the monster-riddled ruins of Shoonach. * More than a dozen additional maps depict all the cities of Amn and Tethyr, as well as the distant Maztican colonies." * History: The Empires of the Shining Sea hold tales and legends passed down by word of mouth across the years. The myriad mysteries and dramas of more than 300 rulers across four empires - including the infamous Shoon Imperium - reveal themselves in the history and timeline spanning more than 8,000 years. * Calimshan: The long-fallen empire of Calimshan rises yet again, as a new ruler and new power groups take control of the former land of the genies. Updated and expanded by more than 100 pages since its first appearance in FR3, Empires of the Sands, Calimshan shows itself to be a land bent on returning to its former greatness - at any and all costs! * The Land of the Lions: This rugged land sandwiched between the Deepwash and the Lake of Steam seems empty, but many surprises lurk among its plains and woods - nomads and raiders astride giant lynxes, elder orbs, ruined cities, lost cultures, and more! * The Lake of Steam: This steaming bay of the Shining Sea unveils its secrets, proving that it holds more than easy trade routes to the Inner Sea. Scarlet pearls the size of a human fist or the smoking majesty of the volcanic Arnrock tempt those who dare test its deceptively calm waters. * Also inside are two full-color poster maps showing Calimshan and the Lake of Steam region at 30-mile-per-inch scale."